Of all the Temari patterns out there, I feel this is the easiest. It teaches the basic stitch, goes together so intuitively, and looks spectacular once it’s done. Have a front-row seat in one of Marilyn’s most popular classes. Fair warning: you may love making these things so much you will find a new passion in thread. Enjoy! This class requires no previous crafting experience. It is suitable for any student age 12 to adult. 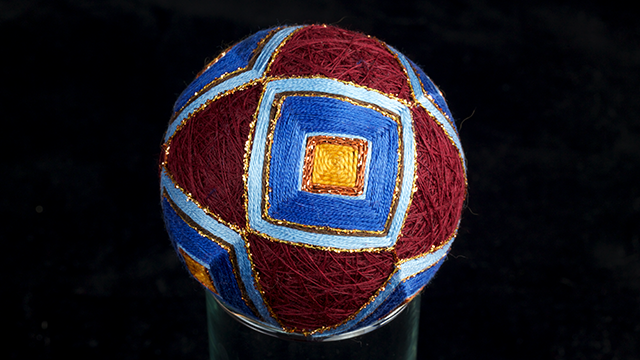 Materials needed for this Japanese folk craft include waste yarn, sewing thread, pearle cotton threads, metallic threads in your favorite colors, plus a 3 inch needle. Pins are used as an aid for dividing the blank.